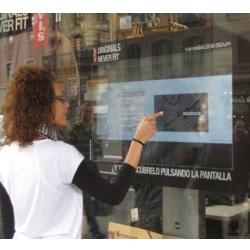 Interactive Foil turns any window or panel into an interactive display. It fits behind glass or sheet material being used without any drilling or additional work. Installation is quick and easy with temporary and permanent options. The product is reliable and is used successfully throughout the world. Take advantage of the expanding market for through window/glass touch screen applications with the SIRKOM Touch Foil. Our through glass touch screen foil technology is the perfect solution to make our projection screens interactive touch screens, creating a through window touch experience. 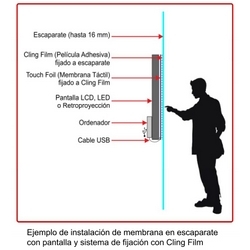 The SIRKOM Touch foil has no external components so the installation is completely safe and vandal proof. 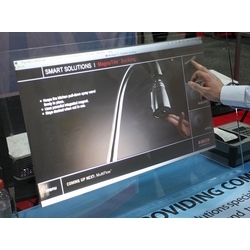 The lightweight Touch Foil can be applied directly to a window, a glass/acrylic sheet with a rear projection screen or LCD screen positioned behind creating through-window/glass touch interaction. 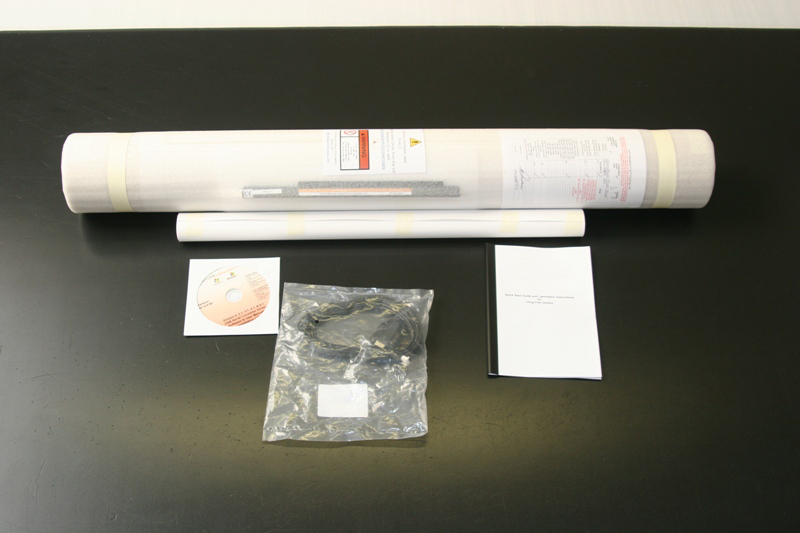 The SIRKOM Touch foil can be mounted to the glass using either a permanent or a removable fixing method allowing the touch unit to be moved to another location if required. Interactive Foil is actually a thin, clear, flexible plastic foil, with a matrix of tiny wires inside, almost invisible to the eye. Interactive Foil is combined with rear projection screens, front projection screens, LCD panels, printed panels etc to create your own interactive display. Interactive Foil works by ‘projected capacitance’ – an invisible field that detects a finger location with great accuracy (even if you have a glove on). Interactive Foil works through non-metallic sheets (e.g. glass, acrylic, wood etc), transparent (e.g. windows) and opaque (e.g. 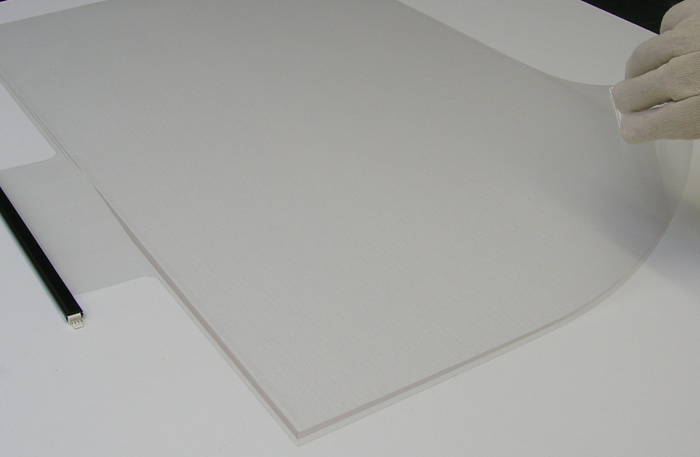 a printed display board) up to 16mm (0.63”) thick. - It can work through double-glazing up to 25mm (1”) (special option available). - It will work with LCD panels. 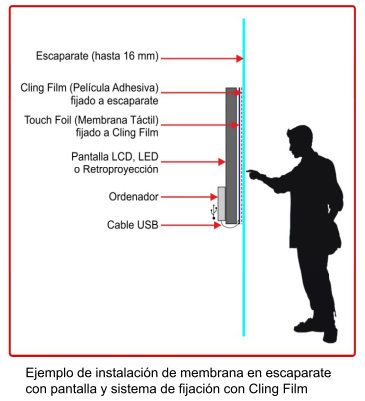 - It will NOT work with plasma panels (they produce too much EM interference). There is a tiny bar containing the control board mounted to one side of the main plastic sheet. - (Standard 6m— 19.6’. Options to 15m— 49’; boosters required over 15m). - Touch Foil takes its power from this RS232 connection. Interactive Foil comes complete with Windows driver software. - All normal mouse functions can be generated (click, double click, drag etc). 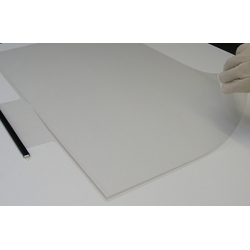 * Lightweight touch foil simple to apply to a window, glass, acrylic and rear projection screens and any other non-metallic material. * Works with all existing multimedia applications PowerPoint, Macromedia flash, Web sites etc. AMD®Fusion Processor, Full HD 1080P, Supports USB 3.0, Supports DX11. The most attractive PC solution, perfect for Digital Signage solutions in demanding eviroments. Compact computer with last generation processor and ultra-low power consume. The monitors are stretched with a wide aspect ratio, perfect for displaying two separate pieces of content. This Display is designed for use in educational, retail, public and commercial signage applications. This widescreen LCD ACCOMMODATES MIXED MEDIA CONTENT with enough room for movies, internet content, digital pictures, PowerPoint, Flash files and much more. This Commercial Display features an elegant slim bezel design that’s ideal for public information. The high brightness and contrast ratio and wide viewing angles clearly communicate your message regardless of ambient light. Touch Screen, IPS Panel. Innovative, interactive, sleek, and slender, LG LCD touchscreen monitors M4210T is gaining widespread attention. The LG Shine-Out commercial monitor reflects away the sunlight displaying vivid and clear images. Even in direct sunlight conditions, the image quality is uncompromised making it ideal for semi-outdoor and window displays. This Commercial Display features an elegant ultra slim bezel design that’s ideal for public information. The high brightness and contrast ratio and wide viewing angles clearly communicate your message regardless of ambient light. This Commercial Display lets you communicate targeted messages to JUST THE RIGHT AUDIENCE AT JUST THE RIGHT TIME. This 1080p LCD panel displays precise images for nearly print-like quality in your digital signage applications. Touch Screen, IPS Panel. Innovative, interactive, sleek, and slender, LG LCD touchscreen monitors M4716T is gaining widespread attention. Our touch foil can be applied directly to a window or a glass sheet and then a rear projection screen or LCD can be mounted behind the touch foil to create a through-window/glass touch experience. PC, monitor and TFT touch screen all in a polished stainless steel chassis and with a depth of only 60 mm thick. With IP55 protection against dust and splashing and resistive touchscreen. PC, monitor and TFT touch screen all in a polished stainless steel chassis and with a depth of only 60 mm thick. With IP55 protection against dust and splashing and ELO IntelliTouch touchscreen with anti-reflection. Transparenet Display Samsung 22" HDMI Ideal for Showcases and Vending machines. Touch option available. Transparenet Display Samsung 46" LVDS Ideal for Showcases and Vending machines. Touch option available. With 3-edge Bluetooth antennas that allow up to 21 simultaneous connections and a range of up to 100 meters, SRK bluetooth server is ideal for installation in locations with a large influx of people. Home Theather lighting system with two 58.4CM light wands for 32" to 60" screens. includes remote control. Self-service terminal which integrates hardware and software (Linux) to create an interactive environment such as product display for sale, and information display for multimedia.